Best play-date for those ages 6 and under. Exhaust them with 2 hours of indoor play. 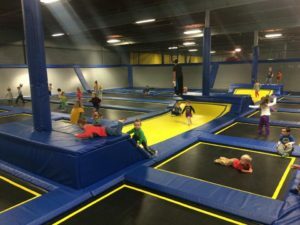 They can bounce, jump, and play on trampolines, bounce house, Jungle Gym, and Little Tykes Pedal cars. These Play times are strictly for ages 6 and under so they can, crawl, walk, play without concern of the older kids jumping too close. A parent is welcome to join their child in the activities. Cost is $9 per child with 1 Parent included. See All the Events for Toddlers Here.